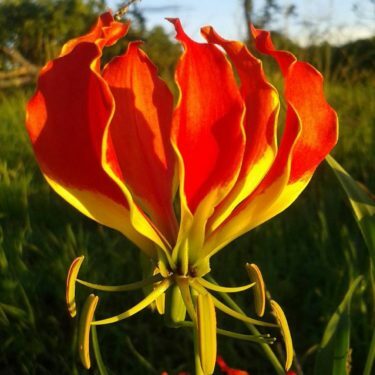 The flame lily is widespread in tropical and southern Africa, thriving on the sparse savannah woodlands, sand dunes and grassland in sandy loam soil. This perennial herb can reach a height of around 3 metres, rambling and and climbing over neighbouring plants using the tendrils at the end of its leaves. A spectacular climber with striking distinctive flowers of subtle colour variations from a dark pink/red, red through to yellow and orange. All parts of the plant are extremely poisonous due to the presence of toxic alkaloids including colchicine and can be fatal if eaten. Even to touch the plant can result in skin irritation. A word of caution… Known to have been the cause of many accidental deaths, this tuberous rooted deciduous plant has also been used to poison dogs and induce abortions. That said, some moles and African porcupines appear to be able to nibble at the roots with no ill effect. Protection… the flame lily is cultivated for its beautiful flowers but not in Zimbabwe – because it’s the country’s national flower it’s protected under the Parks and Wildlife Act from illegal harvesting.